Intracranial arteriovenous malformations (AVMs) are lesions in the brain where blood vessels are connecting abnormally. They are relatively uncommon but increasingly discovered lesions that can lead to significant neurological disability or death, and they commonly present following an intracranial hemorrhage or seizure, although with contemporary brain imaging techniques, an increasing number of incidental lesions are found. Over the last decade, there have been substantial developments in the management of intracranial AVMs. There has been an evolution of techniques to treat these lesions, and as the management options have evolved, individual and combined modality treatment protocols have been developed in different institutions for the management of AVMs. Current interventional therapy for brain arteriovenous malformations (bAVMs) is varied and includes open neurosurgical resection, radiosurgery, and endovascular (blood vessel) management, either alone or in combination. The choice of management is largely dependent on the decisions of the local physicians that make up the treatment team, and a recent survey has demonstrated substantial variability in decision-making for almost all AVMs. We will be collaborating with the CHUM Research Center in Montreal, Canada on their pre-launched TOBAS study in 2015. The primary goal of this trial and registry study is to offer the best management possible for patients with brain AVMs in terms of long-term outcomes, despite the presence of uncertainty. Management may include interventional therapy (neurosurgery or radiosurgery, alone or in combination, with or without endovascular procedures, alone or combined) or conservative management. An expert multidisciplinary study group will review patients on an individual basis to determine eligibility for the trial or registry parts of the study. The trial has been designed to test whether conservative management or interventional therapy will reduce the risk of disabiling stroke or death. A secondary goal of this study is to determine if interventional management is effective in the prevention of neurological events during 10 years and to determine the morbidity and mortality related to therapy. Regardless of management strategy chosen, we will follow-up and record the neurological events and the neurological status of all patients with brain AVMs recruited an dmanaged in our institutions. Hemorrhagic presentation with mass effect requiring surgical management. 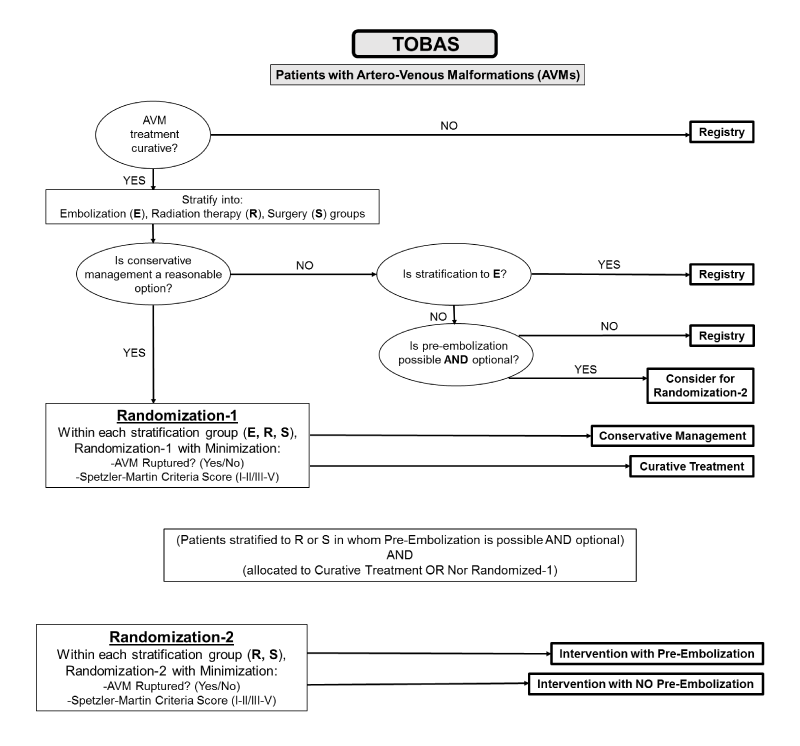 In these cases, if a residual AVM is found after the initial surgery, the patient could then be a candidate for TOBAS. controlled trial. Trials (2015) 16:497.